Allyn Jaffrey-Shulman had added another chapter to the amazing story of the Shulman family in winning the 2012 Seniors World Championship, which concluded in thrilling fashion. The well-known Card Player magazine attorney and columnist (pictured left, thanks to wsop.com) collected USD $603,713 in prize money. This year’s seniors event – open to players age 50 and over – drew an amazing 4128 entrants, making it the largest such event in poker history. The turnout eclipsed last year’s number by more than 400 players. In fact, this tournament was the largest single-day start in poker history. Jaffrey-Shulman topped a stellar final table that included some notable players including two-time gold bracelet winner Hoyt Corkins. Dennis Phillips, best known for his third-place in the 2009 Main Event Championship, was the runner up this time to Jaffrey-Shulman. The victory by a female in an open event breaks a long-running streak of 249 straight male winners of gold bracelet events. Vanessa Selbst was the last female winner of a gold bracelet (aside from the annual Ladies World Championship) in 2008. This was Jaffrey-Shulman’s first WSOP gold bracelet victory following several previous deep runs, cashes, and final table appearances. Her husband, Barry Shulman, and stepson, Jeff Shulman, both made final tables in the past week. • If there’s any doubt the WSOP remains the most popular poker attraction in the history of the planet, take a look at the astronomical numbers for the last three days at the Rio. Friday’s Seniors World Championship drew 4128 players – the most in history for this event. It was also the biggest single-start day in poker history. Saturday’s $1500 buy-in No-Limit Hold’em tournament drew 2811 entrants – up 22 per cent from the same event held the week before. Then Sunday’s $1000 buy-in No-Limit Hold’em tournament attracted 2795 players, right on par with the same buy-in event held earlier at this year’s WSOP, which was 2799. Those three events alone account for 9734 players. 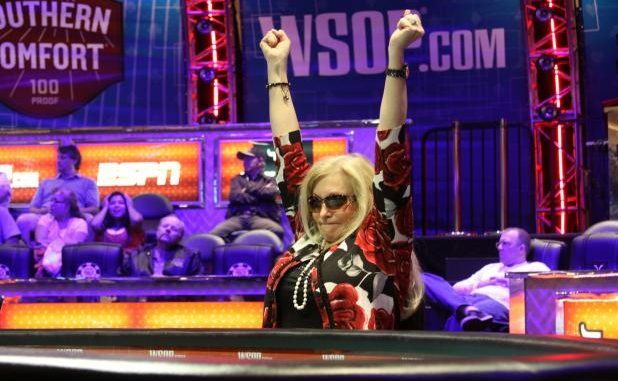 Then, there were the Deep-Stack tournaments, which broke all previous records this week at the WSOP. The non-gold bracelet events drew more than 4000 players overall – including the largest turnout in the event’s history on Sunday. • Larry Wright has added his name to a prestigious list of Texans with a World Series of Poker victory. The part-time poker player and retired businessman who started attending the WSOP in the 1970s, triumphed in the Deuce-to-Seven Draw Lowball (No-Limit) tournament. Wright topped a stacked tournament field of 285 players, including many of the world’s top pros, en route to his first gold bracelet victory. He pocketed $101,975 in prize money. 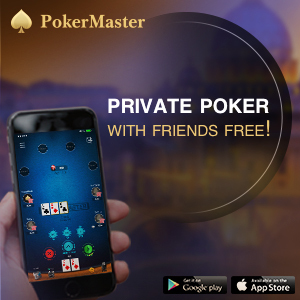 Despite the six-figure score, the bankroll booster was secondary to the validation bestowed by winning poker’s ultimate prize. The final table included a powerhouse line-up including four former WSOP champions. Brandon Cantu, who finished runner up, was shooting for what would have been a third gold bracelet. Michael “The Grinder” Mizrachi (fourth) and Rep Porter (sixth) were in a similar state as two-time winners, but came up short. Erick Lindgren, another former champ, ended up in fifth place. Wright announced that he would donate the majority of the money to a housing and construction projects he’s helped fund in Sudan. • The field in Event #31, the $1500 buy-in No Limit Hold’em tournament is down 19 players from a starting field of 2811. 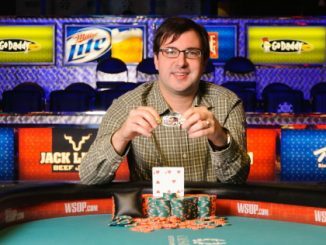 The current chip leader is 2010 WSOP Main Event winner Joe Cada with Carter Phillips, JC Tran and Dwyte Pilgrim among the remaining contenders. 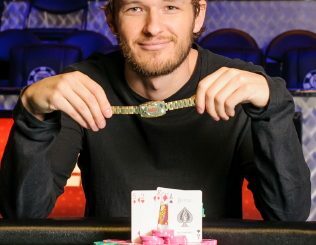 John Monnette leads the $10,000 buy-in H.O.R.S.E. field into day three in his pursuit of a second bracelet for 2012 and third in the past two years. Not surprisingly, a world class line-up will pursue Monnette for the title, including David Bach, Phil Hellmuth, John Hennigan, Dan Kelly, Scott Clements and Phil Ivey. All 231 players left in Event #33, the $1000 buy-in No Limit Hold’em tournament, are ensured a payout including Aussies Justin Cohen, John Corr and Tim Duckworth. Brad Libson holds a narrow chip lead with plenty of poker to play. Two new events kick-off today – the $5000 buy-in Six-Handed Pot Limit Omaha (event #34) and $2500 buy-in Mixed Hold’em (Limit/No-Limit, event #35).